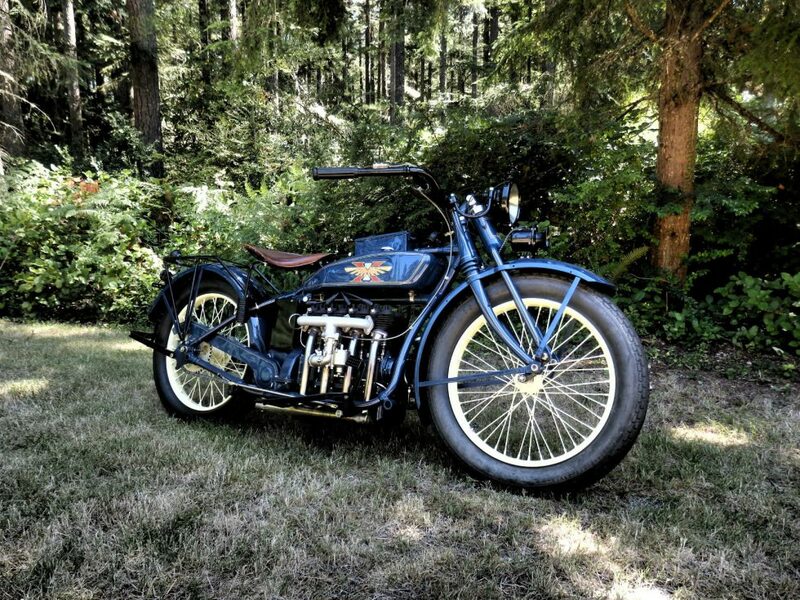 The Henderson was the bike that in 1922 beat Harley-Davidson fair and square. Henderson had been showing their motorcycle to the Chicago Police Department and the police were interested in this four cylinder bike that Henderson was able to demonstrate doing 98mph. Harley-Davidson also wanted to sell bikes to the Chicago Police and so they challenged Henderson to a series of twelve speed trials. The trials were held on Dundee Road in Chicago and Harley-Davidson managed to win just one of the twelve trials. The Henderson won eleven and did so achieving that magical 100mph. 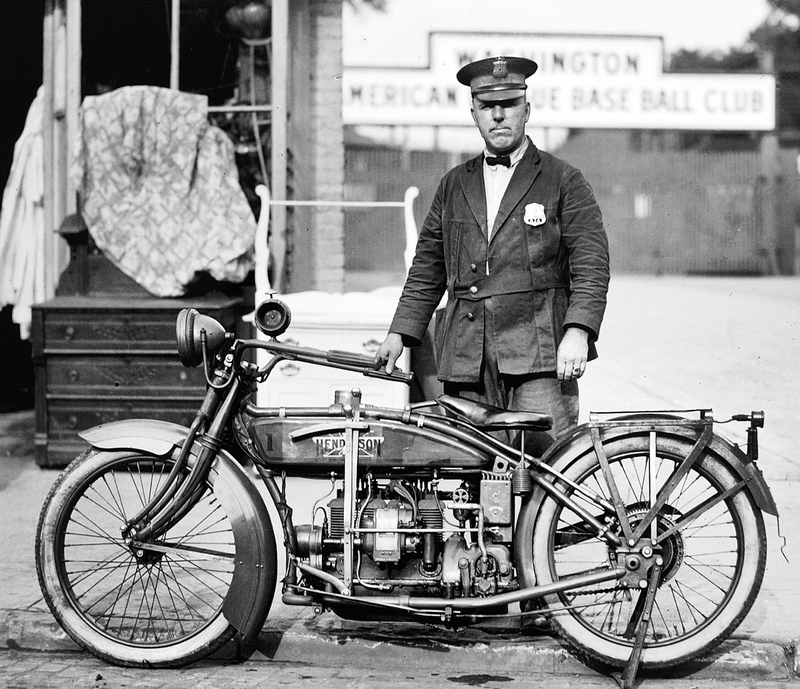 1922 picture of a Washington D.C. police officer with his straight four Henderson. (Picture courtesy motorcycle.com). So although it was ultimately Harley-Davidson that survived whilst Henderson basically quit whilst they were ahead as soon as the Wall Street Crash heralded in the Great Depression yet the Henderson was the bike to be reckoned with during the 1920’s. These bikes were fast becoming known for their efficient engines that were proving to be both powerful by comparison with their contemporaries and reliable. Also in 1922 a Henderson set a speed and endurance record at the Tacoma Speedway in Washington racking up 1562.54 miles in 24 hours with an 65.1 mph average speed. That solo record that was not broken until 1937 by a rider on a Harley-Davidson, but that was long after Henderson had voluntarily ceased operations. This 1926 Henderson looks very similar to its 1922 sibling. (Picture courtesy eBay). By 1925 the Henderson was available with alloy pistons and by 1926 helical timing gears which made the engine somewhat quieter. The frame had been re-designed to rake more quickly at the rear thus requiring a shorter and fatter fuel tank. 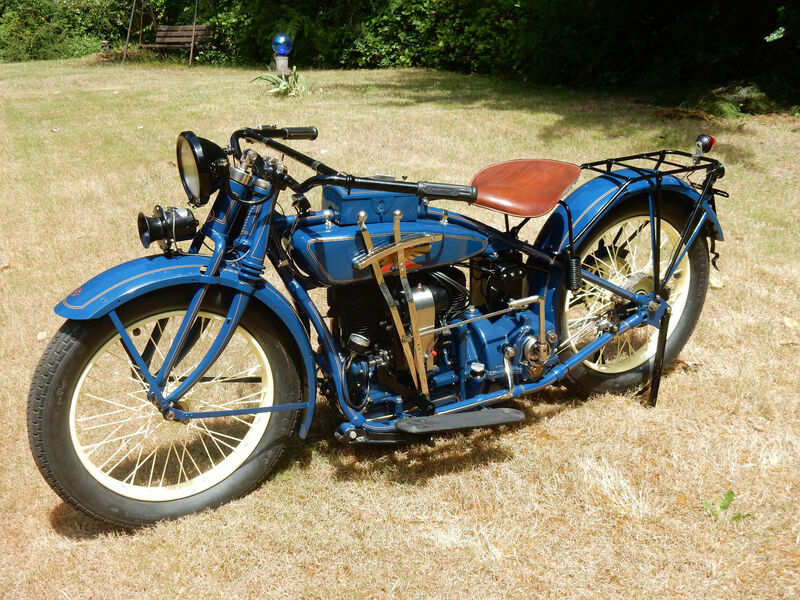 Previous Hendersons had been built around the idea that it was preferable to carry your pillion passenger in front of the rider, much as was done on biplanes of the twenties. This necessitated long handlebars and can’t have been good for handling. But by the 1925 model year that idea had been done away with and the bikes were very nicely proportioned. Left side view of the 1926 Henderson. (Picture courtesy eBay). In 1926 the Henderson was available with choice of cast iron pistons for USD$465.00 or alloy pistons for USD$485.00. A side-car would cost you an additional USD$135.00. The bikes were finished in blue whilst the wheel rims were enameled in cream, as we can see for our featured bike. 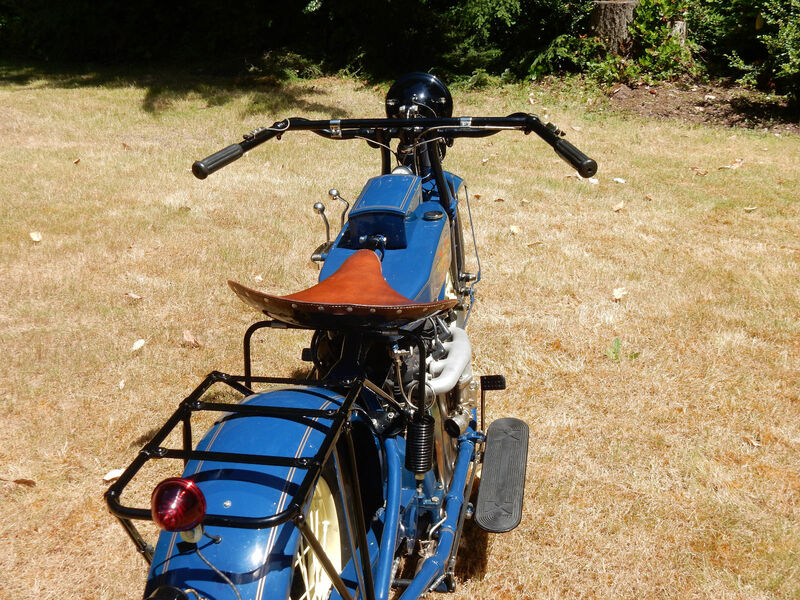 The bike has been meticulously restored right down to the correct leather seat. (Picture courtesy eBay). The bike we have featured in our photographs is currently for sale on eBay. The bike has been meticulously restored including a complete engine re-build and in fact the engine is not yet run in as the bike has hardly been ridden since restoration. At time of publication there were three days left on this auction. You will find the eBay sale page for this bike if you click here. 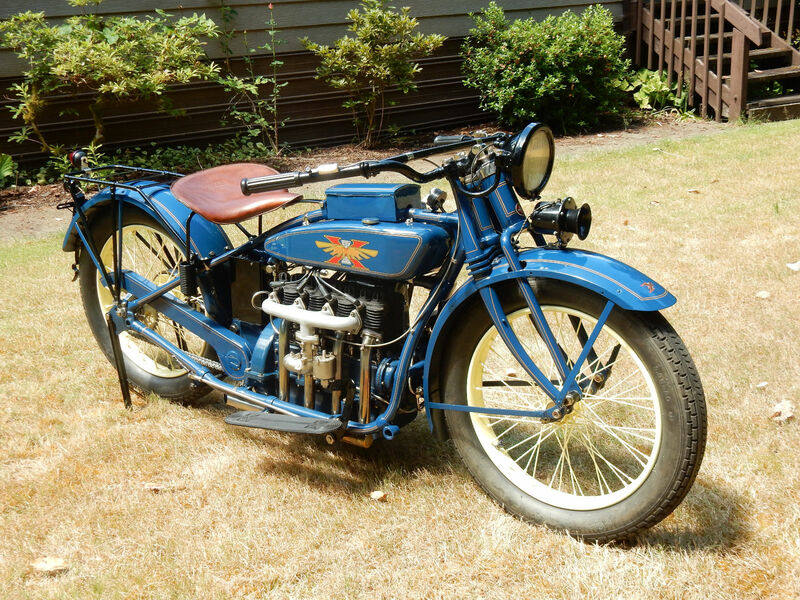 Henderson was one of the best known and most desirable motorcycles in the pre-Depression era. They were known for speed, endurance, reliability, comfort and quality – albeit at a somewhat higher price than their competitors. These bikes were popular with police officers because of that combination of speed, comfort and reliability. The Henderson Deluxe continued in production up until 1928 when it was replaced by the new Streamline model, the KJ. Henderson voluntarily closed for business in mid-late 1931. They had been one of the “Big Three” American motorcycle manufacturers along with Harley-Davidson and Indian. 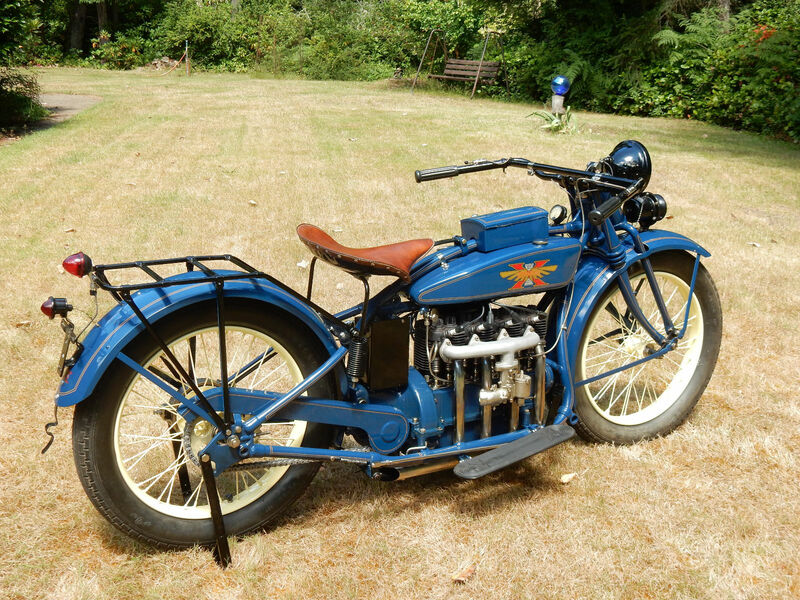 With its in-line four cylinder engine the Henderson must have been an impressive looking motorcycle back in the twenties. (Picture courtesy eBay).